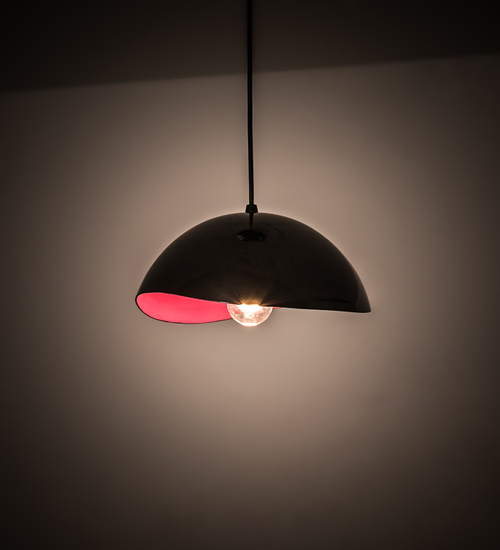 Description: A cool curvaceous styled pendant, Gravity features a wavy edged Aluminum shade that is featured in a Jet Black finish strikingly set on the outer surface and amazingly contrasting against a Pink Matte powder coat internal metallic finish. The richly appointed interior results in a stunning burnished glow while revealing a customer supplied medium base lamp. Handcrafted in our 180,000 square foot manufacturing facility in Yorkville, NY, this fixture is offered with custom styles, finishes, and sizes and is available with dimmable LED and other energy efficient lamping options. The pendant is UL and cUL listed for dry and damp locations.